I was recently working on a case where I needed to download and PDF a Twitter stream to preserve the information in case the information was deleted or changed at a later date. The simple solution was to create a PDF of the Twitter stream, but when I tried that, it looked like a jumbled mess. Try printing something from Twitter and you will see what I mean. In addition to trying to create a PDF using Acrobat and Google Chrome’s built-in PDF tool, I tried using various web capture tools such as Screen Capture and Awesome Screenshot on Google Chrome. I found both to work well with pages with only a few hundred tweets, but for larger pages with hundreds or thousands of tweets, they crashed. I also tried Evernote and Springpad, but neither was able to keep the format of the Twitter stream to my liking. After some digging around, I found a solution that not only preserves the Twitter stream but keeps the same look and feel in PDF format and maintains all the links. Although I didn’t really care about keeping the exact format, I wanted it to be presentable, in case it needed to be used in court. I also wanted the final document to be user friendly, and a PDF seemed like a logical choice. A full version of Adobe Acrobat (not the free version). I used Adobe Acrobat 9 Standard, but I am sure that older and newer versions of Adobe Acrobat would work as well. Some other PDF software may also do the job, but I did not test any out. Your own Twitter account (make a new one if you have to). Step 1: Log on to Twitter (this will not work if you don’t log in). 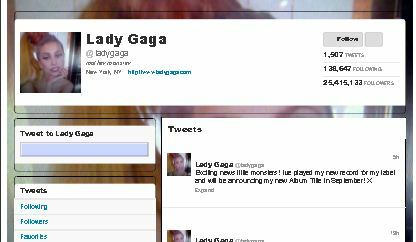 Step 2: Using your Internet browser, find the stream that you want to capture (i.e., http://www.twitter.com/#!/[Enter User Name Here]; e.g., http://www.twitter.com/#!/ladygaga). Step 3: By default, Twitter shows only the most recent 100 or so tweets. Keep scrolling to the bottom of the page until you get the first tweet that was posted (this may take some time if there are lots of tweets). Step 4: Download a complete version of the web page. In Chrome, select the Wrench icon and select “Save Page As…” (In Internet Explorer click Save As and in Firefox select Save Page As.) By default the file type should be set to “Webpage, Complete”; if not, select it. Make sure you save the file in a place where you can find it. Step 5: Open the full version of Adobe Acrobat. Go to File > Create PDF > From File. Select the HTML file that you downloaded (it should be called something like “Barack Obama (barackobama) on Twitter.html”) and create the PDF. There you have it. A PDF version of a Twitter Stream. It’s not perfect, but it looks pretty decent; it’s preserved in PDF so it can’t be altered; you can search specific keywords; and all the links operate in case you need to access the linked information later. Thanks for detailing the way you captured twitter streams. Thanks Jason. Glad you found it helpful.